* in a recording for the TV programme ‘Top of the Pops’ in the UK (with Shane McGowan), Kirsty changed the lyrics slightly to ‘You scumbag, you maggot, you’re cheap and your haggard’ – wording which was later used by Maire Brennan in Ronan Keating’s cover version. The Guardian published a fine piece about the song in 2012. There are so many of these they have their own series of pages … there are many many more out there! Follow those links to find straight covers, punk covers, all male vocals, all female vocals, accordions, fiddles, bagpipes, piano solos, guitars solos (we spared you the bass solo but it’s out there ;o), young folks, old folks, Swedish, German, bar- rooms, studios, bedrooms, stages, radio, TV, New York, London, Paris, Munich, talk about … Fairytale of New York — the modern standard. 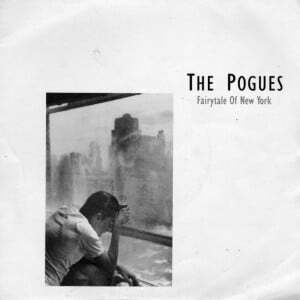 ‘FAIRYTALE OF NEW YORK’ is obviously enough on ‘Essential Pogues’ (1991) and ‘The Very Best of the Pogues’ (WEA 2001), and also appears on the CD soundtrack from the TV show ‘Ghosts of Oxford Street’ (1991). ‘Tom Dunne’s 30 Best Irish Hits’ (2001 Lunar with Phil Lynott, Undertones, Ash, Horslips). ‘Celtic Inspiration Volume 2’ (Nectar, Eddi Reader, Capercaillie, Van Morrison, Bob Geldof.). ‘Greatest Irish Bands’ (U2, Van Morrison, Thin Lizzy, Clannad), ‘A Hard Night’s Day’ (A History of Stiff Records), an anonymous looking ‘Essential Hits’ set from 2005. ‘Celtica’ volume 4 appears to be a French compilation including Dar Ar Braz, Maire Brennan, La Lugh and the Gordon Highlanders. It has also appeared on ‘Now That’s What I Call Music Vol. 10’ (1987) and ‘This is the 80s’, one of a recent glut of 80s nostalgia collections which are springing up everywhere. One of those lovely duets albums: ‘Together: 38 Classic All Time Duets & Collaborations ’ (2002 Universal, George Michael & Elton John, Joe Cocker & Jennifer Warnes, Marvin Gaye & Kim Weston,‘’ Clannad & Bono). Peculiarly it also appears in karaoke form on ‘Italian Love Songs’. thanks for keeping the vibe a’vibratin! Fairytale is still my favourite Christmas song bar none. A bittersweet tale that gets me every time, especially the “.well so could anyone.” part. Bless you Kirsty.